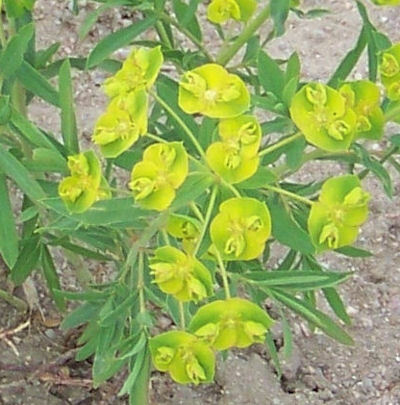 Leafy spurge is and herbaceous perennial with very deep root systems and milky sap. The sap can be distasteful to animals and potentially cause blisters. It grows to be .5-3' tall and is legally classified a noxious weed. Leaves: Leaves are 1-4" long and are hairless, bluish green and are linear with pointed tips. Flowers: Flowers are yellowish green and are usually paired with 7-10 pairs at the tops of the stem and usually bloom in late spring to mid summer. Fruits & Seeds: Mature seed pods disperse seeds explosively, expelling seeds up to 20' away. Roots: Woody rhizomes can grow as deep as 15' and can spread laterally up to 35'. Leafy spurge will invade oak savannas, prairies, fields pastures and roadsides. They are most aggressive where soil moisture is limited.